Figure 1. Lava moves across the ground as a pahoehoe flow, Kilauea Volcano, Hawaii. Credit: J. D. Griggs / U.S. Geological Survey. Figure 2. 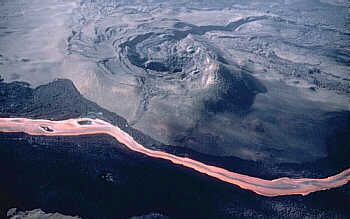 Aerial view of a channelized a'a flow on Mauna Loa Volcano, Hawai'i. Credit: J. D. Griggs / U.S. Geological Survey. Figure 3. Aerial view of lava delta (center, left of volcanic fume) growing seaward at Kamoamoa on Kilauea Volcano, Hawaii. The new land is about 450 m long and 180 m wide (from sea to old shoreline). Credit: C. Heliker / U.S. Geological Survey. Figure 4. Lava fountain of the Pu'u O'o cinder and spatter cone on Kilauea Volcano, Hawaii. Credit: J. D. Griggs, U.S. Geological Survey. Figure 5. Aerial view of a lava lake atop the Kupaianaha vent on the east rift zone of Kilauea Volcano, Hawaii. The fume rising from the end of the narrow part of the lava lake marks the beginning of a lava tube. Credit: E. W. Wolfe, U.S. Geological Survey. Figure 6. Thurston (Nahuku) lava tube near summit caldera of Kilauea Volcano in Hawaii Volcanoes National Park. Credit: Hawaii Volcanoes National Park. Lava is molten rock that erupts onto the surface of a planet or moon, from a volcano or fissure, and is hot enough to flow (before it reaches the surface it is called magma); also, the rock formed by solidification of this material. 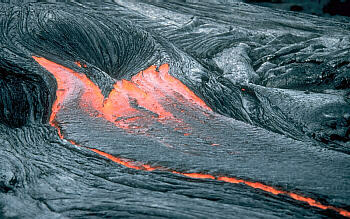 Lava flows are described as pillow lava, pahoehoe, and a'a. See also scoria. Silica-rich lava hardens before flowing far, forming a dense-texture rock of tiny crystals or glass. Basic lava flows further before it solidifies, giving rise to coarse-grained igneous rock, such as granite or gabbro. 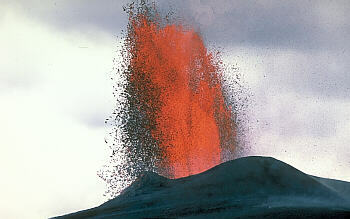 In many eruptions, lava is ejected with such force that it fragments in the atmosphere, hardens while airborne, and lands to form thick layers of volcanic tuff and related pyroclastic rock. The word lava is from the Italian word for stream, which is derived from the Latin verb lavare – to wash.
A lava flow is a mass of molten rock that pours onto Earth's surface during an effusive eruption. Both moving lava and the resulting solidified deposit are referred to as lava flows. Because of the wide range in (1) viscosity of the different lava types (basalt, andesite, dacite, and rhyolite); (2) lava discharge during eruptions; and (3) characteristics of the erupting vent and topography over which lava travels, lava flows come in a great variety of shapes and sizes (see Figures 1 and 2). A lava delta is a wide fan-shaped area of new land formed from lava that has entered the sea (see Figure 3). Such new land is usually built on sloping layers of loose lava fragments and flows. On steep submarine slopes, these layers of debris are unstable and often lead to the sudden collapse of lava deltas into the sea. 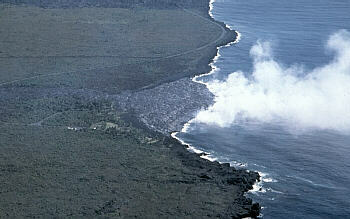 The partial collapse of a lava delta can be a hazard for people who venture too close to lava entering the ocean. For example, on April 19, 1993, one person was killed and 16 others injured when a section of an active lava delta on which they were standing collapsed into the sea at Kilauea Volcano, Hawaii. A lava fountain is an eruption of molten material from a fissure, vent, or active lava lakes (see Figure 4)Lava fountains form when gas bubbles in molten rock rapidly expand as they reach the surface, forcing the lava to be erupted high into the air. Most lava fountains rise to about 10 to 100 meters (30 feet to 330 feet) in height, although they occasionally reach even greater heights. The highest lava fountain ever recorded occurred in 1986 on the Izu-Oshima volcano in Japan. It reached a height of 1,600 meters (5,200 feet). The world's longest continuous lava fountain in historical time was erupted from the 25-kilometer long Laki Fissure in southern Iceland in 1783. Lava fountains have also been observed beyond Earth, in the Tvashtar region of Jupiter's volcanically active moon Io. The Tvashtar fountains have been seen to reach a height of more than 1.5 kilometers and involve lava at a temperature of 1,000 K to 1,600 K.
A lava lake is a large volume of molten lava, usually basaltic, contained in a vent, crater, or broad depression (see Figure 5). Scientists use the term to describe both lava lakes that are molten and those that are partly or completely solidified. Lava lakes can form (1) from one or more vents in a crater that erupts enough lava to partially fill the crater; (2) when lava pours into a crater or broad depression and partially fills the crater; and (3) atop a new vent that erupts lava continuously for a period of several weeks or more and slowly builds a crater higher and higher above the surrounding ground. Lava lakes can be as deep as 120 meters (400 feet), and can take as long as 30 years to cool and solidify. Active lava lakes typically consist of a partially solidified shiny gray crust because its surface is constantly cooled by the atmosphere. The crust is seldom more than 5-30 centimeters thick, or more than a few minutes or hours old, because the crust continually circulates, breaks, and sinks into the moving molten lava below. The pattern of movement on the surface of lava lakes is often compared to the type of large-scale movement that occurs between the huge plates that make up the Earth's crust, including subduction, spreading, and strike-slip movement. Lava lakes occur at relatively few volcanoes in the world. For example, since 1980, lava lakes have formed at Kilauea Volcano in Hawaii, Mount Erebus in Antarctica (involving rare phonolitic lava), Erta' Ale in Ethiopia and Nyiragongo in Zaire. A lava tube is a natural conduit through which lava travels beneath the surface of a lava flow (see Figure 6). Tubes form by the crusting over of lava channels and pahoehoe flows. A broad lava-flow field often consists of a main lava tube and a series of smaller tubes that supply lava to the front of one or more separate flows. When the supply of lava stops at the end of an eruption or lava is diverted elsewhere, lava in the tube system drains downslope and leaves partially empty conduits beneath the ground. Such drained tubes commonly exhibit "high-lava" marks on their walls, generally flat floors, and many lava stalactites that hang from the roof. 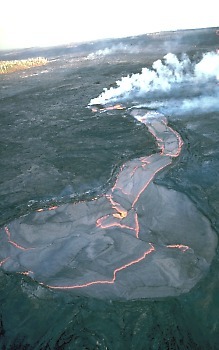 Lava can also erode downward, deepening the tube and leaving empty space above the flowing lava. 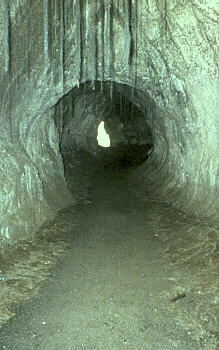 Lava tubes can be as small as about a meter (3 feet) across or as large as a railway tunnel.